« NO COVER! Reggae Jamdown! April 20th at the Cantina is always a good time and this year is no different. 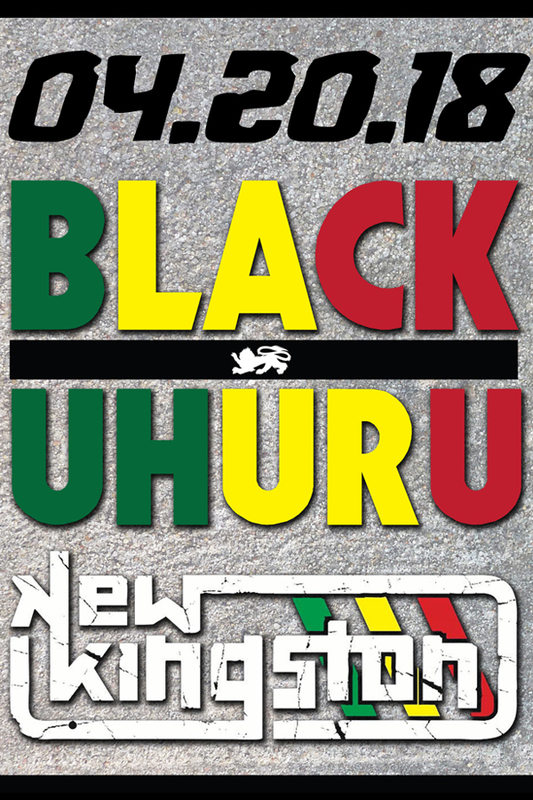 We are thrilled to welcome back Black Uhuru and New Kingston for a night of most righteous reggae. Derrick “Duckie” Simpson the “Gong Gong Gullie” is the founder and leader for reggae’s Black Uhuru. Although going through numerous lead singers and musicians they have remained to be one of the most recognized and prolific reggae band for over 50 years. New Kingston is a progressive reggae group whose members combine their Jamaican heritage with the urban sounds of their New York home, New Kingston are a family band consisting of brothers Tahir, Courtney Jr., and Stephen along with their father, Courtney Panton, Sr. A first-generation Jamaican-American, Courtney the elder was active in New York’s reggae scene before turning his sons on to the music of their island heritage. Born out of jam sessions in the family’s Brooklyn basement, the brothers began their career playing Bob Marley and Earth, Wind & Fire covers at parties and gatherings around the neighborhood. By 2010, they’d become focused on their own writing, which fused R&B, hip-hop, and dancehall with traditional reggae sounds.